Bangkok Airways Public Company Limited (Thai: บางกอกแอร์เวย์) is a regional airline based in Bangkok, Thailand. It operates scheduled services to destinations in Thailand, Bangladesh, Cambodia, China, Hong Kong, Laos, Maldives, Burma, India, and Singapore. 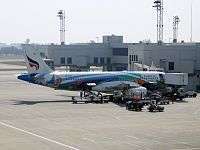 Its main base is Suvarnabhumi Airport, Bangkok. Bangkok Airways is currently an official sponsor of Bangkok Glass FC, Chiangrai UTD, Chiang Mai FC, Trat FC, Lampang FC, Sukhothai FC, and Bangkok Christian College FC. Airline ranking company Skytrax has consistently ranked Bangkok Airways very highly, currently giving them a four-star rating. The airline was established in 1968 as Sahakol Air operating air-taxi services under contract from Overseas International Construction Company (OICC), an American construction company, United States Operations Mission (USOM), and a number of other organisations engaged in oil and natural-gas exploration in the Gulf of Thailand. It began scheduled services in 1986, becoming Thailand's first privately-owned domestic airline. It re-branded to become Bangkok Airways in 1989. The airline is owned by Prasert Prasarttong-Osoth (92.31 percent), Sahakol Estate (4.3 percent), Bangkok Dusit Medical Services (1.2 percent), and other shareholders (2.19 percent). It has 1,903 employees and also wholly owns subsidiary airline Siem Reap Airways. It built its own airport on Ko Samui, which was opened in April 1989 and offers direct flights between the island and Chiang Mai, Hong Kong, Krabi, Pattaya, Phuket, and Singapore. The airline opened its second airport at Sukhothai Province in 1996. A third airport was built in Trat Province, opening in March 2003 to serve the burgeoning tourism destination of Ko Chang. The airline made its first foray into jet aircraft in 2000, when it started adding Boeing 717s to its fleet. Up until then, Bangkok Airways had flown propeller-driven aircraft, primarily the ATR-72. It had also operated the De Havilland Canada Dash 8, the Shorts 330 and for a short time, a Fokker F100. The carrier added another jet, the Airbus A320, to its fleet in 2004. Bangkok Airways plans to order wide-body aircraft as part of its ambition to expand its fleet. It wants to add its first wide-body jets in 2006 to serve longer-haul destinations such as London, India, and Japan and is looking at Airbus A330, Airbus A340 and Boeing 787 aircraft. In December 2005, Bangkok Airways announced it had decided to negotiate an order for six Airbus A350-800 aircraft in a 258-seat configuration, to be delivered to the airline commencing 2013 but the order of the aircraft was cancelled in 2011 due to the further delay of the Airbus plane. In 2007, President and CEO of Bangkok Airways Prasert Prasarttong-Osoth received from Kaewkwan Watcharoethai, the Royal Household Secretary-General, a royal warrant appointment to display the Garuda emblem. In November 2015, Bangkok Airways announced plans to expand its footprint in China, Vietnam, and Myanmar. Bangkok Airways ATR 72, Luang Prabang Airport. A Bangkok Airways Airbus A320-200. An Airbus A320-200, Phuket International Airport. On 7 December 1987, Sahakol Air Hawker Siddeley HS 748 Series 2A (registration HS-THH), was damaged beyond repair after it overran the runway on landing at Udon Thani Airport (UTH) with no fatalities. On 21 November 1990, Bangkok Airways flight 125 de Havilland Canada DHC-8-103 crashed on Koh Samui while attempting to land in heavy rain and high winds. All 38 people on board perished. In August 2002 an ATR 72-200 skidded off the runway while landing at Siem Reap International Airport. There were no injures. The airport was closed for 2 days. 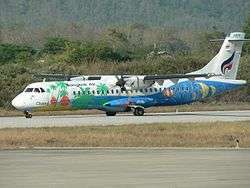 On 4 August 2009, Bangkok Airways Flight 266, operated by an ATR-72 between Krabi and Ko Samui skidded off the runway, killing one of the pilots. The 68 passengers were evacuated. Of the passengers evacuated, 6 sustained serious injuries while another 4 were treated for minor injuries. 1 2 Kositchotethana, Boonsong (2016-02-27). "TAA, Bangkok Airways post healthy profits". Bangkok Post. Retrieved 27 February 2016. ↑ "Contact Us." Bangkok Airways. Retrieved on 12 May 2010. 1 2 "Directory: World Airlines". Flight International. 27 March 2007. p. 84. ↑ "Bangkok Airways appears to cancel A350-800 order". Flightglobal.com. 2011-09-06. Retrieved 2012-11-08. ↑ "Bangkok Airways receive the Royal Garuda Emblem". Travel Blackboard. 16 April 2007. Retrieved 24 January 2011. 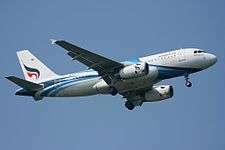 ↑ "Bangkok Airways Plans Koh Samui - Chengdu Service from July 2016". routesonline. Retrieved 15 June 2016. 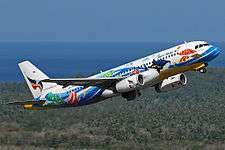 ↑ "Bangkok Airways delays Koh Samui – China launch to Dec 2016". routesonline. Retrieved 6 September 2016. ↑ "Bangkok Airways Adds Phuket – Hat Yai Route from late-Oct 2015". Airlineroute.net. 5 August 2015. Retrieved 5 August 2015. ↑ "Profile on Bangkok Airways". CAPA. Centre for Aviation. Archived from the original on 2016-10-29. Retrieved 2016-10-29. ↑ "Bangkok Airways". CH-Aviation.net. Retrieved 1 July 2013. ↑ "Bangkok Air orders three ATR 72-600s". World Airline News. 2014-07-09. Retrieved 27 Feb 2015. ↑ "Koh Samui crash". Plane Crash Info. Archived from the original on 9 March 2014. Retrieved 6 October 2014. ↑ Shearing, Caroline (5 August 2009). "Koh Samui airport reopens after plane crash". The Daily Telegraph. London. Retrieved 26 April 2010. Wikimedia Commons has media related to Bangkok Airways.